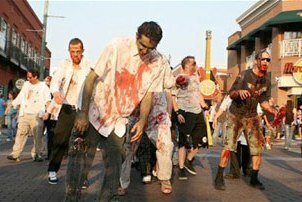 You know those apocalyptic movies where the world is near extinction because we are being overrun by Zombies? They became Zombi-fied from a virus that is circumnavigating the world at an exponential rate. The movie will go back in time, briefly, to show us the unnoticed, seemingly insignificant, event that first sent the virus airborne into a lethal chain reaction. It’s usually something as benign as a pet chimp sneezing into their new owner’s cereal bowl. The intent is to suggest that it’s something so unforeseeable that it could be happening as we sit in this very theater. What if we are at the beginning of one of those sequences of events right now? Could we implode from a cacophony of conflicting nuances, divergent political agendas, contradictory rules, extended punishments, threats, insults, and misunderstandings? I’m not an alarmist, by nature, but my interest in politics compels me to look for patterns in current events. As a writer, I translate those observations into common analogies to grasp what is going on. Make sense? No? Well…. in America, our solutions to problems, historically, are comparable to an antiquated idea of child rearing. If there is a behavior that alarms us, punish the culprit and the problem will go away because no one likes to be punished. So we castigate, eliminate, or incarcerate everything and everyone that had anything to do with anything or anyone who might have said, done, or listened to anything or anyone that might have misconstrued, misjudged, misappropriated or misbehaved. What happens in reality, however, is the behavior is simply displaced and moves somewhere else or is transposed into a different, but equally poor, behavior. We have come to a very precarious place where many people think that banishment, chastisement, punishment, censorship and walls can replace education, understanding, compassion, diplomacy and bridges; silence the protest and we eliminate the problem. Censor the protester, politician, pundit, satirist, musician, writer, parent, teacher, or student…and the conflict is corrected. In reality, however, we create a more frightened and more fragile society. And I’m concerned. We must not silence the voices holding our leaders accountable because they are the narrators of our story. They are the ones who can illuminate that sequence of events before it’s too late. Can you excuse me for a moment? My chimpanzee has a cold. You must be <a href="http://garyhasissues.com/wp-login.php?redirect_to=http%3A%2F%2Fgaryhasissues.com%2F2017%2F07%2Fthe-end-of-the-world-as-we-know-it%2F">logged in</a> to post a comment.